You’ve blown a fuse. What do you do? Well, first of all, most of us don’t actually have “fuses” anymore; instead, we have circuit breakers. Second, you need to find the specific circuit breaker switch connected to the items you plugged in. These are located on your electrical panel. 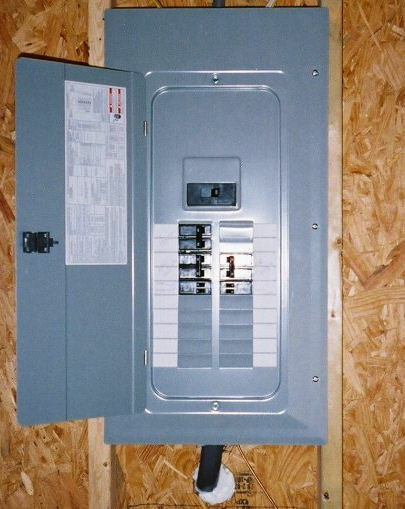 An electrical panel (or breaker panel) is where all the breaker switches are located. And that’s just what they are; switches that can be flipped. There’s likely a “main” circuit breaker that controls the power to the entire house, but you’ll also see individual breakers, responsible for providing the electricity to various parts of your home. Each circuit breaker has a lever that can be turned “on” or “off.” Each breaker should have its own label so you can identify the area of the house affected. If you do live in a house still controlled by “fuses,” you won’t see any levers, but instead, you’ll have screw-in fuses. Please note that your home insurance provider will want to know about your electrical panel. If your home still has fuses, you may have difficulty getting insurance, or you may have to pay a higher rate. The power to your home comes through an electrical meter located outside and is routed to your electrical panel. Remember the “main” circuit breaker, mentioned above? It is usually larger than the rest and can be used to shut off the power to the whole house at once. In other words, it “breaks the circuit.” It also tells you the amperage of your electrical panel. This amperage should be no less than 100 and can be 200 or 400 amps. Please note that your home insurance provider will be very interested in the number of amps. If it’s less than 100, your system may need updating. This could make it difficult for you to obtain insurance, or you may end up having to pay a higher rate. Each circuit breaker is designed to trip when the circuit is overloaded. This is a definite safety device. If the breaker didn’t trip and shut off the power, there could be trouble. Each breaker is designed to carry a certain amount of current. If it carries too much, the wires could overheat and possibly catch fire. A single circuit breaker is normally designed to provide 120 volts. This is the typical amount needed for lights, TVs, etc. Since circuit breaks would make up the bulk of the breakers in your electrical panel. A double circuit breaker is designed to provide 240 volts. This is for the big appliances that draw a lot of power, such as a stove or electric dryer. When the breaker trips, it’s a simple matter to just reset it. In older homes, with fuses, the fuse is damaged once it has blown, and needs a replacement. Turn off the power to the item(s) that caused the breaker to trip. So, in this case, shut off your blow dryer, or your microwave, or both. Go to the electrical panel box. In a house, this is usually located in the basement, or in the room with your furnace and water heater. In an apartment, it’s often in the entrance near your front door. Find the tripped breaker. The lever will be in between the “on” and “off” positions when it’s been tripped. Push the lever all the way to the “off” position, then back to the “on” position. Now you should be able to use your electrical devices again. Just remember, don’t use them all at the same time. Or you can move one of them to a different outlet. If you’ve shut off the offending electrical item, and the circuit breaker continues to trip, there could be another problem. Short circuit: This situation is a bit more serious. When one hot wire touches another, it will cause a short circuit. There could be a problem with the wiring in your home or a problem with an item you’ve plugged in. Shut off the power to the outlet. Check the power cord to see if there are any melted areas, or any other damage. Take a look at the outlet itself, and check for a burning smell or any dark discoloration. Ground fault: This is very similar to a short circuit. It happens when a hot wire touches the ground wire. It could also happen when a hot wire touches the side of the outlet box. Unless you really know what you’re doing around electricity, this may be the time to call in a professional. Hometips.com has some good information about checking your circuit breakers when the power goes out. About.com outlines how to tell if there’s a short circuit in the wiring or in the item you’re plugging in. What can you do to maintain your electrical panel? Like everything else in your home, a little maintenance goes a long way. When it comes to your electrical panel, always keep the cover on, and make sure it’s kept closed. This will prevent dust from entering, or other damage occurring. Consider getting regular maintenance done by an electrician about once every three years. They will take the cover completely off the panel, and will inspect the breakers. They’ll check all the connections, and do a thermal check to see if there’s an unusually high temperature anywhere. Generally speaking, high temperatures and electrical problems go together. You can even put your hand on the cover of the electrical panel, and see if it feels cool. If it’s hot, you should shut off the main breaker, and call your electric company. They’ll come right away. PowerhouseTV.com has a video on maintaining your electrical panel. What is the life expectancy of an electrical panel? Most people think that when you buy a house, the electrical panel will last as long as the house does. Not necessarily so. Connections can loosen, and an increased level of usage can affect the electrical panel’s effectiveness. In humid locations, your electrical panel can suffer from corrosion. Excessive dust can also be a factor in shortening the life of the panel. If you maintain your electrical panel properly and have it inspected regularly, it will last a long time. It may need updating if your needs change. For instance, if you’ve put in a hot tub, pool, or another high energy use item, you may have to call in an electrician to make the necessary changes. Home handyman tinkering can also affect the lifespan of an electrical panel. If changes have been made to the panel by someone other than a licensed electrician, it could cause problems over time. This is another good reason to have your panel inspected. McGarry and Madsen has a good article on the life expectancy of electrical systems. Your insurance company will want to know what kind of electrical panel you have. If you have an up-to-date panel with 100 amp circuit breakers, you will likely be okay. If you have an old-fashioned fuse box, most insurance companies today may be unable to provide you with coverage, or may require you to get an electrical inspection. Why is it difficult to get insurance? Fuse boxes are out of date, and can also be tampered with. For instance, some people may replace a lower amp fuse, such as a 15 amp, with a higher one, such as a 30 amp, to allow more electricity to run through without “blowing a fuse”. But because the wires were never meant to withstand that amount of electricity and heat, a huge fire hazard results! Another “trick” is inserting a penny instead of a new fuse. This is a terrible fire hazard! Without a fuse, there is nothing to stop wires from seriously overheating and causing a fire. Modern electrical panels have at least 100 amp circuit breakers in place to prevent wires from overheating. This is what insurance companies will want to know. They are taking a calculated risk by insuring your home, and outdated electrical panels with 60 amp breakers, or even with fuses, are no longer sufficient to handle the electrical needs of a home today. If you’re not sure whether you have a proper, modern electrical panel, ask an expert, and know exactly what you have, before shopping around for home insurance. For more information on electrical panels, or to get a quote on your home insurance, contact Square One at 1.855.331.6933.